Everyone keeps on using the word "raw" when describing best foreign action films. 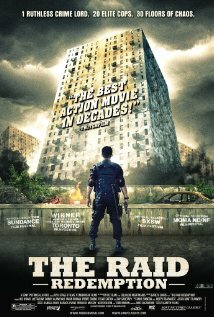 It has been used so many times that I am now confused what it actually means... until I saw The Raid. If you want an action film that is so badass that it's going to make you grow some chest hair and miraculously have a tattoo appear on you neck just by watching it, this is the movie for you. It's non-stop, d@mn the special effects let's break each others' skull kind of action. Don't forget to visit Amazon for Best Action Foreign Films. The story is pretty simple. An 20-man elite police task force assaults a building to arrest a crime lord, Tama Riyadi. A newbie, Rama, is a one of them. They were able to infiltrate the building but was soon detected by a lookout. Apparently, the building houses some of the most ruthless criminals in Indonesia. When Tama Riyadi announces on the PA system that he will provide free residence to anyone who kills the police, it was chaos. The criminals was able to finish the police except Rama and his boss. As Rama tries to survive, it is revealed that he has a personal agenda for joining the task force. One of the officers of Tama Riyadi is *spoiler alert* his brother, Andi. Rama wants to bring Andi home. Andi refuses but helps Rama fight the ruthless henchmen of Tama Riyadi. Fighting side by side, they succeed in killing everyone and capturing Tama Riyadi. As Andi helps Rama carry the survivors out of the building, they talk and it is revealed Andi has no intention of surrendering. He is not the new leader in the building. As mentioned, the film is characterized by brutal action sequences. It used thetraditional Indonesian martial art pencak silat. I am not familiar with the martial arts but if the film did the martial arts justice, I'm gonna go on record and say that's one heck of a martial arts. It is sadistic and merciless and the Director made sure the audience feels that. The apartment is dirty and everyone is sweaty which adds to the gritty feel of the film. It is almost as if you can smell their sweat. Blood rains and body parts fly. Bones break and the director does not hold back in showing them. You can see knives penetrating the skins and the blood splattering all over that you would half expect to have some of those red on you. You can see the contact and you can feel their pain and it makes you want to jump into the scene and fight with them... or cheer for them. It's a movie for those who want action... brutal action. In other words, it's one of the must see foreign films for me. Come back for more best foreign action films and Asian Music Blog Recommendations.